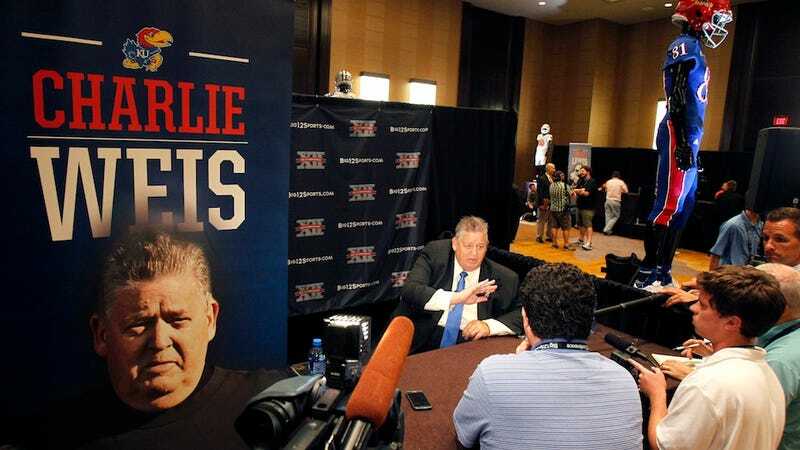 Did last year's 1-11 season—dare we say it!—humble Charlie Weis? Answer: Maybe! Weis told reporters at today's Big 12 media day that it would be "justifiable" to pick Kansas to again finish last in the conference. It seems he's also not showing off his Super Bowl rings to lure recruits anymore. Nope. Weis this year brought in a class of junior college transfers by opting instead for what he calls a more "practical" sales pitch. Have you looked at that pile of crap out there? It's not as catchy as "Rock Chalk, Jayhawk," but it is simple, practical, hum—oh, who are we kidding. This is Charlie Weis we're talking about. He'll be back to bullying student reporters again before the end of September.